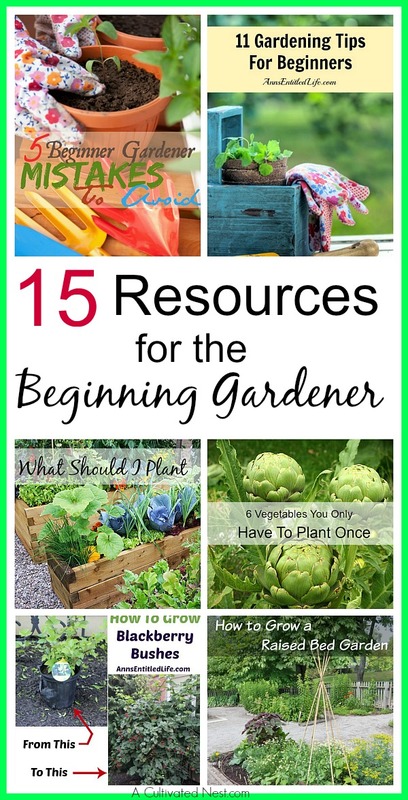 It’s time to start planning out your garden! We’re still having the occasional freezing night here, so I’m not ready to really start my garden just yet. But that’s okay, as it gives me more time to plan! Something I was considering doing in my garden this year is making a square foot garden (also called a SFG). Supposedly, square foot gardens are easier to manage than regular gardens, and use less water and dirt. If you’re considering a SFG for your garden this year, then you’ll like my free Square Foot Garden Planner Printable! If you want to grow your own vegetables, but want an easier time doing so, then you should really consider a square foot garden! Square foot gardening is actually a pretty new idea. It was introduced to the world in the 1980s via Mel Bartholomew’s book “Square Foot Gardening” (he has since written an updated version). Mel was just a hobbyist gardener, but was tired of how much work and how many resources the typical single row garden used. Square foot gardening was his solution to that problem, and because it’s a great idea, the method quickly spread. There are some basic rules to building a square foot garden. First of all, you have to use square shaped beds (typically 4×4 feet), which you then break down into smaller 1 foot square areas. You lay a grid on top of the garden as a visual indicator of the squares (you can DIY a grid out of wood or plastic pipes). The beds are raised and should be 6-12 inches deep. You can get a ready to assemble cedar bed from Amazon, or DIY your own. You plant 1, 4, 9, or 16 plants in each square (the number depends on the size of what vegetable you’re planting). Also, the garden must be small enough that you can reach into it. You never walk on the dirt. Mel also suggests a certain soil mixture (1 part peat moss, 1 part compost, 1 part vermiculite) to reduce the chance of weeds, and keep the soil nutrient-rich and moist. Lastly, you don’t pull plants out when you’re thinning, you just cut them with scissors (this way you don’t bother the roots of other nearby plants). Obviously there’s a lot more to square foot gardening (which is why there’s a book), but that’s the basics. While it isn’t a perfect system (it can be hard to grow very large plants like melons, and it isn’t the most cost-efficient if you want to fill a large space with beds), it’s still a very good method. In particular, it’s great if you don’t have a lot of space but still want to a big veggie harvest. And of course, it’s an easier gardening method, making it great for vegetable gardening beginners! 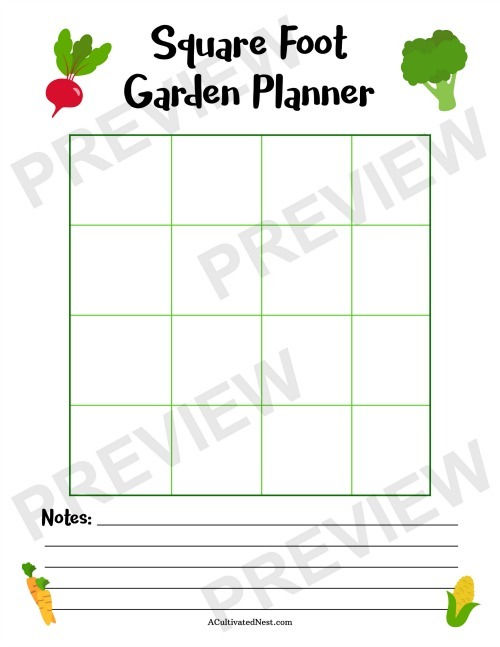 My free printable square foot garden planner below is designed for the typical 4×4′ square foot garden. Fill it out with words, little veggie sketches, or just dots to represent each plant. However you find it easiest to plan your garden. If you plan to make multiple beds, just print out multiple printables! 1. Follow the link above and download the printable. 2. Print your printable, either from directly within your browser or via the free Adobe Acrobat Reader program (which you can get here). You don’t need any special paper for this, regular printer paper is fine. 3. 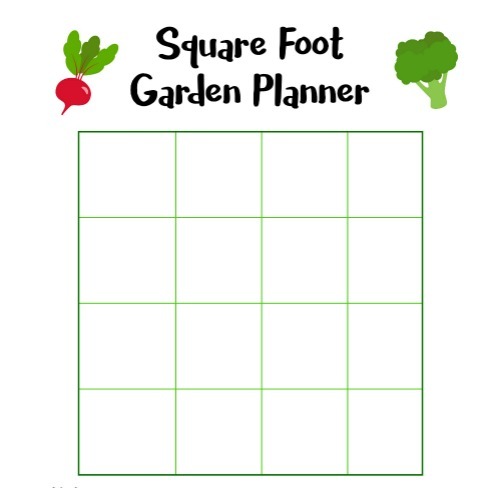 Then fill out your square foot garden planner and enjoy planning out your vegetable garden! What do you plan to grow in your garden?